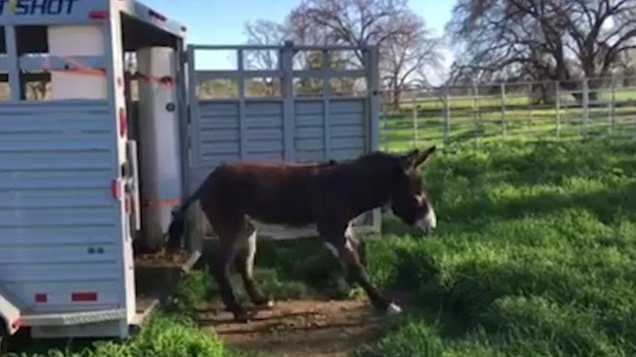 Eight Arizona donkeys got the shock of their life when they were moved to a California ranch and saw grass for the very first time. Montgomery Creek Ranch has posted a video of the adorable moment the Black Mountain burros almost stood still in shock as they gazed at their new home. In the clip the first burro jumps out of the truck and then immediately jumps back before he can touch the grass, so shocked by the bright green sight. He remains standing still in the small patch of dirt, gazing in wonder at this newfound lush land. A second burro soon joins him on the patch, sniffing the grass in wonderment before they both take a few first apprehensive bites of the turf. The rest of the burros soon join them, excitedly stepping out into their new world. 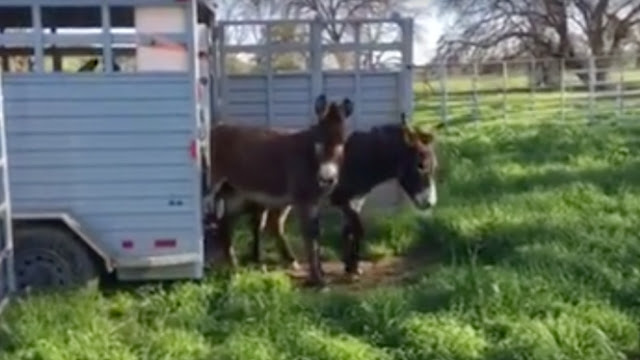 Montgomery Creek Ranch explained that the video was filmed as the burros were first being introduced to the 'foreign' terrain. Montgomery Creek Ranch is a wild horse sanctuary in Northern California, giving refuge to horses and burros that have been removed from Western public lands. These wild horses are not good candidates for adoption, and so the ranch provides them with a place where they can remain free. Responses to "Arizona burros confused to see magical green grass for the first time"
Almost unbelievable that they have never seen a meadow of grass before. So sad really. Bless you all. voila le paradis enfin !!!!!!!! !